The speedmeisters at German tuning haus RUF are hard at work developing an electric version of the Porsche Cayman that could go head-to-head with the Tesla Roadster, and we could see it as early as next month. The car will feature a 150-kilowatt motor (about 201 horsepower) producing 479 ft-pounds of torque, and its lithium-ion battery will have a range of 155 to 186 miles, according to Auto Motor und Sport magazine. RUF claims the car will have a top speed of 125 mph. 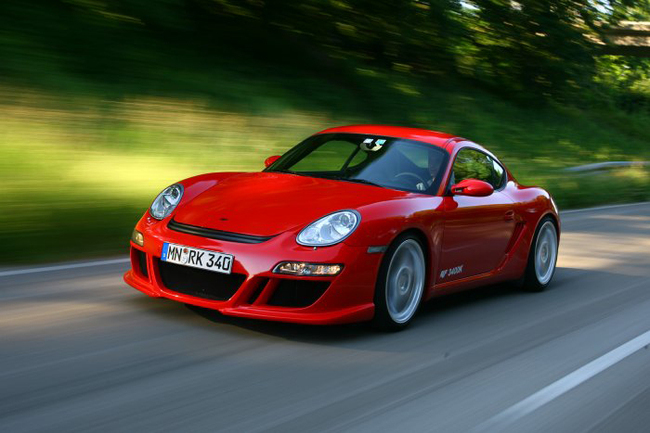 Although the RUF EV would offer less 48 fewer ponies than the Tesla, it would have significantly more torque. No word on what the electric Cayman will look like, but it’s a safe bet RUF will base it on the 3400 K (pictured). That super-Cayman produces 400 horsepower and 324 ft-pounds of torque and does 0 to 62 mph in 4.4 seconds. With more torque on tap, the electric version might shave a few ticks off that time and could even beat the Tesla’s 0-to-60 sprint of 4.0 seconds. Auto Motor und Sport says the car will be unveiled next month.